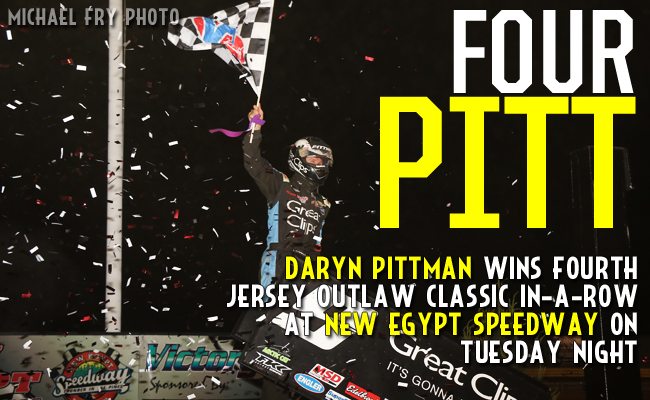 NEW EGYPT, N.J. - May 24, 2016 - It wasn't easy, but 2013 World of Outlaws Craftsman® Sprint Car Series champion Daryn Pittman managed to charge his way from the third starting position to claim his fourth Jersey Outlaw Classic win in-a-row on Tuesday night at New Egypt (N.J.) Speedway. Pittman, who won this event in 2013, '14 and '15, secured his fourth win of the season and first since USA Raceway in Tucson, Ariz. on April 18. "I've been really frustrated with myself with how many front-row starts I've had this year and as few wins," Pittman said. "I got up this morning and thought 'Man, third is where I want to start' - I just had that feeling this morning that if I start third I was going to win. "Things went our way and we ended up starting third." Pittman had to work around race-long leader Greg Hodnett, who had dominated the feature and the preliminary races up to that point. "It was a little bit disappointing seeing the late race caution," Hodnett said. "[Pittman] was definitely better than us in traffic, and I was kind of glued to the bottom in turn one and two and he motored around the top. "I didn't go up there until he passed and then I realized there was a whole other track to run on. fWe kind of caught him again in traffic and passed a couple lapped cars, but we just needed to keep running. He was definaetely the faster car, we just needed him to slow down a little bit through some lapped traffic." At the start of the night, Hodnett, in the Lelands.com/Eagle Steel No. 27, was the first car out for qualifying and established the quickest lap of the night at 13.926 seconds. Hodnett continued his early-night dominance by leading every lap of his heat race and advancing to the dash. As if he needed it, Hodnett then received a lucky invert draw of zero, keeping him on the pole-position for the six-lap race. The Pennsylvania driver kept his clean sweep of the events going by leading every lap and winning the dash to place himself on the pole for the 30-lap feature. When the green flag dropped, Hodnett again appeared to be the driver to beat, as he easily controlled the top spot and pulled away from his competition to start the race. As the race marched on, Pittman, in the Great Clips/Sage Fruit No. 9, had trouble advancing from his third-starting position. When the leaders hit lapped traffic around lap 10, Pittman began his charge. Pittman's first victim was second-place starter Mark Smith in the Mach 1 Chassis No. M1. Smith, who was making his first start with the Outlaws in 2016, fell to the third position with points-leader Brad Sweet close behind him. It wasn't long before Pittman reeled in the leader and was challenging for the lead near the halfway point in the race. With 14-laps remaining, Pittman rocketed around Hodnett for the lead. Pittman dictated the top spot for the remainder of the race, as he held off Hodnett and Smith on a late-race caution with just four laps left, to capture the checkered flag at New Egypt for the fourth year in-a-row. "We haven't been struggling by any means, but we needed a win," Pittman said. "This really makes me feel good, and makes them feel good going back home to Charlotte this week. We've had some pretty bad finishes but hopefully this can erase that and we can get on a better streak of just running up front. "I felt like I was struggling [later in the race]...Those last four laps, I didn't feel like I made any of them very good, so I wasn't breathing good until I saw them throw the checkered." Hodnett held onto the runner-up position, as he finished in the second position for the second time in the four days after finishing behind Lance Dewease at Williams Grove Speedway on May, 20. "It might be an advantage to see what I am doing...I think it's an advantage in one way, but for us to have the lead and give it away, it's very disappointing. We did the same thing Friday [at Williams Grove Speedway] to Lance [Dewease]. In his first race with the Outlaws in 2016, Smith showed speed all night, as he qualified second, won his heat race, finished second in the dash and finished on the podium in the feature. "I was hoping to come down here and just get a top five, but we got a top three and we're up here on the podium." Smith said. "I kept trying different lanes to try and make some time up on Greg [Hodnett], then I heard somebody, that ended up being Daryn. "He was a lot better than us and drove by us. We were about the same speed as Greg, but we just couldn't go through lapped traffic like Daryn could." The World of Outlaws Craftsman® Sprint Car Series continues their southern migration as the series heads to The Dirt Track at Charlotte for the Circle K/NOS Energy Drink Outlaw Showdown on Friday, May 27. For more race information and ticket purchasing options, visit: www.CharlotteMotorSpeedway.com. RACE NOTES: Daryn Pittman wins at New Egypt Speedway for the fourth consecutive year...Donny Schatz's 10th-place finish is his worst finish since missing the feature at Thunderbowl Raceway on March 13...Brad Sweet's fourth-place finish is his first top-five since winning at Plymouth Speedway on May 13. CONTINGENCY WINNERS - MSD Ignitions ($25 cash): Logan Wagner; MSD Ignitions ($50 cash): Daryn Pittman; Penske Shocks ($50 cash): Brent Marks; JE Pistons ($50 cash): Shane Stewart; VP Racing Fuels ($50 cash): Joey Saldana; Edelbrock ($50 cash): Brent Marks; Comp Cams ($50 cash): Donny Schatz; Morton Buildings ($50 cash): Tim Shaffer; Cometic Gasket ($50 cash): Paul McMahan; Super Flow ($50 cash): Danny Dietrich; Craftsman/Sears ($100 cash): Greg Hodnett; KSE Racing Products ($100 product certificate): Logan Schuchart; Comp Cams ($50 product certificate): Daryn Pittman; JE Pistons (Set of Rings): Logan Schuchart; JE Pistons (Set of Rings): Logan Wagner. SEASON WINNERS: ); Donny Schatz - 7 (Volusia Speedway Park on Feb. 14, The Dirt Track at Las Vegas on March 4, Stockton Dirt Track on March 18, Stockton Dirt Track on March 19, Silver Dollar Speedway on April 2, Lincoln Speedway on May 19, Weedsport Speedway on May 22); Brad Sweet - 6 (Volusia Speedway Park on Feb. 13, Volusia Speedway Park on Feb. 14, Cotton Bowl Speedway on Feb. 26, Ocean Speedway on April 1, Bakersfield Speedway on April 15, Plymouth Speedway on May 13); Daryn Pittman - 4 (Royal Purple Raceway on Feb. 27, Perris Auto Speedway on April 16, USA Raceway on April 18, New Egypt Speedway on May 24); David Gravel - 2 (Thunderbowl Raceway on March 12, Tri-State Speedway on May 14); Joey Saldana - 2 (The Dirt Track at Las Vegas on March 3, Devil's Bowl Speedway on April 22); Shane Stewart - 2 (Arizona Speedway on March 6, Devil's Bowl Speedway on April 23); Lance Dewease - 1 (Williams Grove Speedway on May 20); Jason Johnson - 1 (Placerville Speedway on March 24); Jason Sides - 1 (I-30 Speedway on April 26). World of Outlaws Craftsman® Sprint Car Series Statistical Report; New Egypt Speedway; New Egypt, N.J.; May 24, 2016.